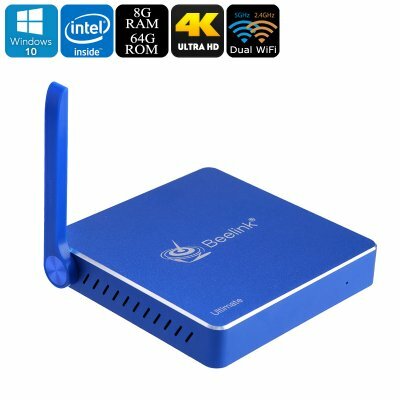 Successfully Added Beelink AP34 Mini PC - Licensed Windows 10, Intel Apollo Lake CPU, 8GB DDR3 RAM, 4K Support, 64GB ROM, Dual-Band WiFi to your Shopping Cart. The Beelink AP34 Mini PC is the perfect gizmo for those of you that have limited space available at home. With its extremely compact design, this mini PC can be placed efficiently nearly anywhere. Despite being small in size, this gadget treats you to all the same features as a regular PC would. Simply hook it up to an external display, and you’ll be able to enjoy all the familiar Windows and MS office features. Thanks to its portable design, it can be easily carried around. From now on, you’ll always be able to enjoy a true PC experience no matter where you’re at. Within its compact body, this Windows mini PC packs the Intel Apollo Lake N3450 processor. Clocked at 2.2GHz, this piece of hardware brings along a powerful performance. Your mini computer furthermore holds 8GB DDR3 RAM and 64GB ROM. The latter of which can be extended via its 128GB SD card slot. This provides you with all the storage needed to keep your games, films, and files. It furthermore supports Ultra-HD 4K resolution. This allows you to fully enjoy your favorite media to its most. Whether you use it for business or fun – this Windows mini PC is sure to meet your demands. Dual-Band WiFi lets you browse the web at lightning speeds. With the Beelink AP34 Mini PC, a laggy internet connection will be an issue of the past. This Windows mini computer lets you stream films and download files in the blink of an eye. Additionally, it lets you engage in online social activities such as Skype calls without dropping a frame. With its Licensed Windows 10 operating system, it is sure to treat you to an outstanding user experience. The Beelink AP34 Mini PC comes with a 12 months warranty, brought to you by the leader in electronic devices as well as wholesale mini computers.. The OS version on this device cannot be upgraded or flashed and any attempts to modify the default OS will void the warranty. As a wholesaler, we provide no software support, advice, or training regarding the operating system and software. Arabic: - ميني ويندوز الكمبيوتر الشخصي - Chinese Simplified: - Windows 迷你电脑 - Czech: - Windows Mini PC - Danish: - Windows Mini PC - Dutch: - Windows Mini PC - French: - Mini PC de Windows - German: - Mini-Windows PC - Hebrew: - מיני Windows PC - Hindi: - Windows Mini PC - Italian: - Mini di Windows PC - Japanese: - Windows ミニ PC - Korean: - 윈도우 미니 PC - Malay: - Windows Mini PC - Norwegian Bokmål: - Windows Mini PC - Romanian: - Windows Mini PC - Russian: - Windows мини-ПК - Spanish: - Windows Mini PC - Thai: - Windows มินิพีซี - Turkish: - Windows Mini PC - Vietnamese: - Cửa sổ Mini PC.